Invite everyone to your modern wedding in vintage poster style with this affordable 3 for 1 wedding invitation. The typography design and your wording are printed in your choice of ink colors and lettering styles. The 3 for 1 wedding invitation includes three pieces - a wedding invitation, response card and reception card - all for one low price. Due to the unique printing process required to offer you this invitation ensemble at a lower cost, all three pieces come on one sheet and are perforated for easy separation. This product features thermography printing. Thermography is a unique printing technique that results in raised lettering you can feel, which adds to the luxurious experience of this printed piece. 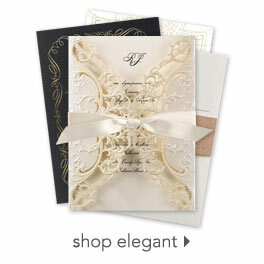 Includes inner and outer invitation envelopes and response card envelopes. I ordered these on a Tuesday and have them on Thursday, I couldn't believe it. They look amazing and I can't wait to send them out!